A recent issue of four stamps on ‘ambalam’ took me back to the days when this folk song was a favourite among children of my age. 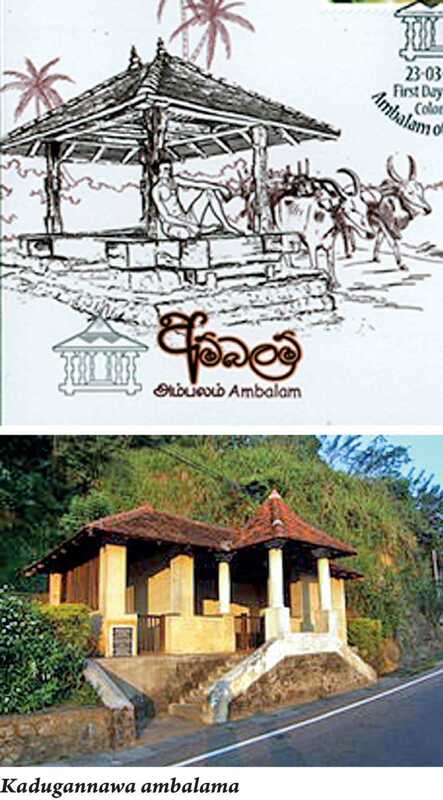 Although it is difficult to determine when exactly ‘ambalam’ were built, judging from the structures seen in several places, they had existed from the time people used to walk long distances and when bullock carts were used to transport goods. Both men and bulls needed a break and these wayside resting places provided them with that facility. Writing in ‘Medieval Sinhalese Art’ about these “wayside shelters”, renowned historian Ananda Coomaraswamy says that “there were many at no great distance apart on frequented paths, and better ones in each village, erected by all the villagers or by some one man (or even a woman) , anxious to perform so meritorious an act”. He adds that the smallest ‘ambalama’ consisted of a foundation of four beams to sit upon, with four posts at the corners and a thatched roof, and the better ones had more pillars and were sometimes divided into compartments for the convenience of those desirous of spending the night there. Saying that they were sometimes well carved, he points out that no provision was made for the entertainment of the strangers, who usually carried their own food and cooking utensils. Openness is the common feature of the early ‘ambalam’. Most of them have been built in or around paddy fields and the structure is virtually the same. The ‘Marassana gama meda ambalama’ (Rs. 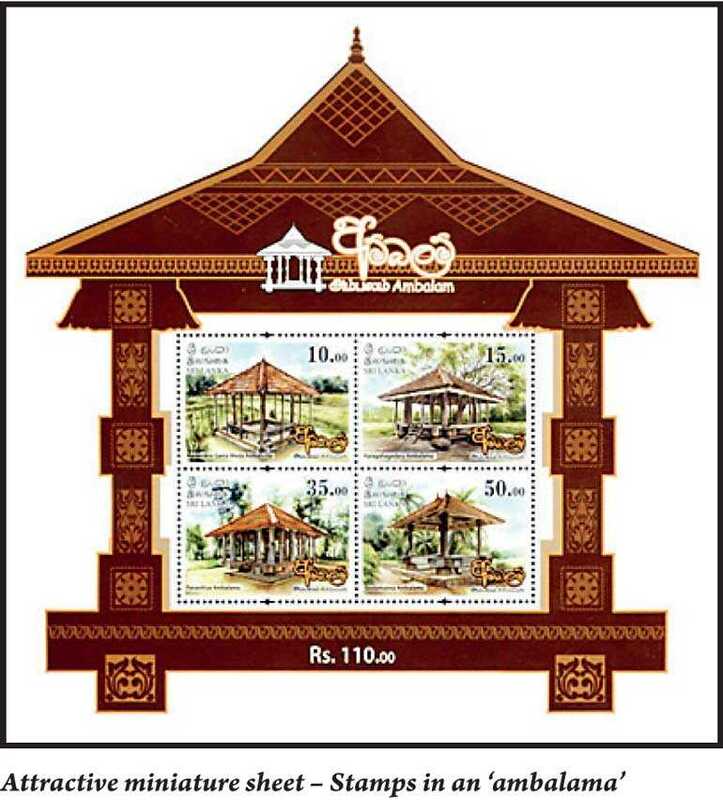 10 stamp) is on the Talatu Oya-Hanguranketa road at Patha Hewaheta in the Kandy District. It is mounted on a platform – about six feet in diameter – consisting of four large wooden logs. It is on four blocks of stone placed on the four corners. Three of the four main timber posts in the four corners have decorative carvings of beautiful creepers, mat designs, and male and female dancers. The other post has been replaced after the original one had decayed. The ‘Panavitiya ambalama’ (Rs. 35 stamp) is in the village of Panavitiya in the Mayuravati Korale of the Devamedi-hatpatthuva of the Kurunegala District. It can be reached by travelling about three miles on a gravel road turning left at the Metiyagane junction which is on the right of the town of Narmmala on the Dambadeniya-Anuradhapura road. Its roof had originally been of straw but had decayed along with many of the carved logs. A fair number of carvings are still in good shape and bear ample testimony to the craftsmanship of the ancient Sinhalese wood carvers. Archaeological Commissioner Charles Godakumbura had taken the initiative in restoring it to its original form. The ‘Godamunna ambalama’ (Rs. 50 stamp) is situated in Godamunna in Patha-Hewaheta area of Gandahe Korale in the Kandy District. It is about four miles away from the 1st mile post on the Talatu Oya-Hanguranketa road. The roof of the ambalama rests on wooden posts on a platform of large wooden beams. All the wooden posts fixed on it are carved beautifully. However, many of the carvings have been peeled off with knives. The Kadugannawa ambalama on the main Colombo-Kandy road cannot be easily missed. Judging from its architecture it is quite clear that it belongs to a later era. Unlike the open ones, it has half walls as well as tall ones separating rooms. Recent renovations give it more the appearance of a small house than the traditional ambalama. There is at least one ambalama in the vicinity of Colombo. It is the one at the Pita-Kotte junction on the Pita-Kotte-Nugegoda road. It is believed that it had existed from the time of the Kingdom of Kotte (15th century). Just as much as people may have visited the capital, Kotte, they would also have come on pilgrimage to worship the Sri Dalada – the Sacred Tooth Relic of the Buddha – which was housed in Kotte. 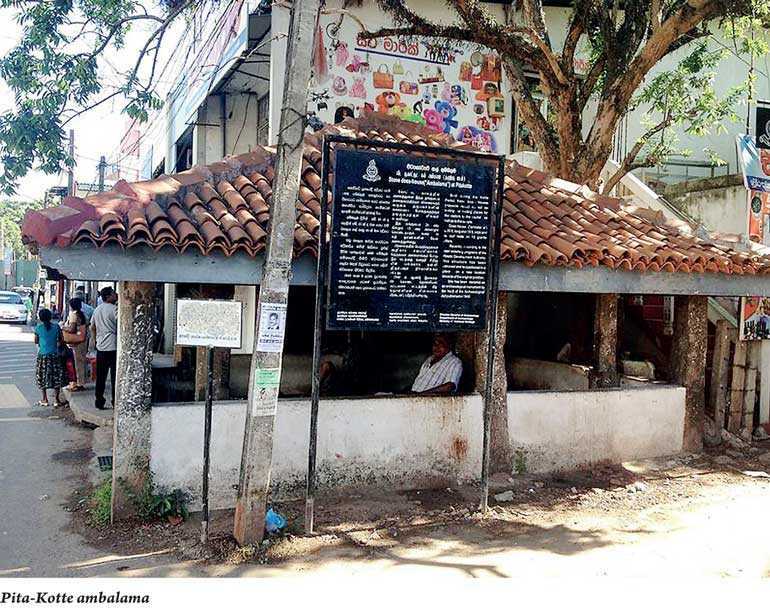 The Department of Archaeology has stepped in to preserve the ‘ambalam’ which are now treated as national treasures. There was a time when they were neglected and people spoilt them by throwing dirt and pasting posters, particularly on the ones close to urban towns. It is heartening to note that the Sri Lanka Philatelic Bureau is on the hunt for new out-of-the-box themes. The era of politicians’ faces seems to be over – or at least suspended. Looking round they are bound to find interesting themes which stamp collectors – both local and foreign – will grab. Designs are also becoming more creative. Well done! Keep going!